Eminem fans were shocked to learn that the rapper was taking part in the Venom soundtrack. The musician posted a brief snippet of the song yesterday, which included the official logo of the movie infused with Eminem's trademark backwards "E" logo. As it turns out, that was just the tip of the iceberg for fans of the rapper because at midnight, he released a full-length album, out of nowhere, which contains the Venom song. Nobody knew that the album was coming and many assumed that the song for the soundtrack was just a one-off. 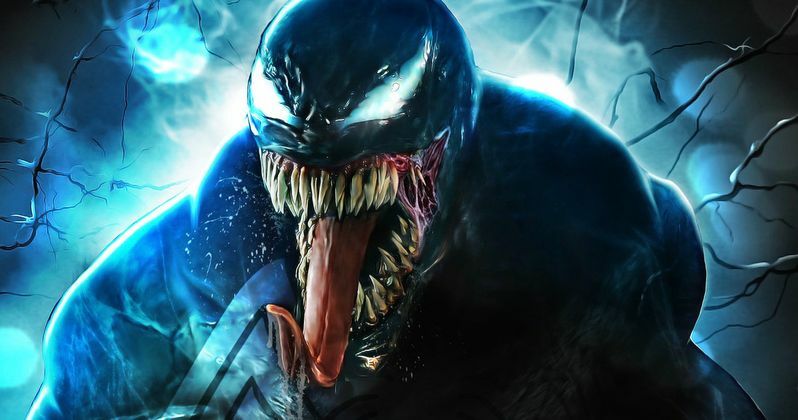 Eminem's song for Sony's Venom finds the rapper comparing himself to the symbiote, referring to himself as an anti-hero. It's more of a return-to-form for Em, and not some gimmicky soundtrack song. In fact, the entire surprise album, which is called Kamikaze, already sounds leaps and bounds better than last year's Revival. The last record was torn apart by fans and critics, so this is Eminem's response, one that he hopes fans don't take too seriously. It's easy to see that the rapper is having some fun, especially from the album cover, which is an homage to the stone cold classic debut of the Beastie Boys' License to Ill. It's not clear whether or not the Venom song inspired Eminem to create a whole new record or not, but it's important to note that he felt that the song was strong enough to go on Kamikaze. The song is obviously not an exclusive for the soundtrack as it has hit airwaves weeks before the release of the movie like Guns N' Roses did with "You Could Be Mine" from the Use Your Illusion II album and Terminator 2: Judgement Day soundtrack. Both songs are strong enough to stand on their own, away from the context of their movies. As for the rest of the Venom soundtrack, there currently is no other news yet. Eminem is clearly taking the spotlight, but it's unclear who else will be involved with the new record. Early reactions to Eminem being involved with the project have gone from excitement to anger. One fan even compared Venom to the 90s Spawn movie for adding the rapper, which isn't exactly such a good thing. But many others have stuck up for the choice, adding that Eminem has done well with his past soundtrack work on 8 Mile and Southpaw. Count Eminem amongst the mainstream artists who were able to completely surprise fans with a full album of material. Radiohead, Beyonce, Kanye West, and Drake are some of the other artists who have dropped surprise records without warning over the last few years. It will be interesting to see how fans react to Kamikaze after the disastrous Revival. But, it's easy to hear, even after one listen of the whole album that Em took some of the criticism of the last album to heart. You can check out the announcement of Kamikaze and the Venom song below, thanks to Eminem's Twitter account. Listen HERE.